Five Hundred (not to be confused with 500 Rummy) is a game for two to five players, though it is most frequently played as a four-player partnership game. It was copyrighted in 1904 by the United States Playing Card Company, makers of Bicycle cards. Since then, it has spread throughout the world, taking root in places such as Australia and New Zealand, and pockets of the United States, such as Ohio and Minnesota. It is worth noting that the rules of Five Hundred vary greatly from locale to locale. Southern Cross, an Australian game company, has even adapted the game for six players by producing a 63-card deck that includes 11s, 12s, and a 13♥ and 13♦. (One has to imagine that, aside from being used for Five Hundred, such a deck has considerable use in pranks.) The following outlines one form of American partnership rules. The object of the game is to be the first partnership to score five hundred points—thus the name Five Hundred—by accurately predicting the number of tricks you will take during a given hand. 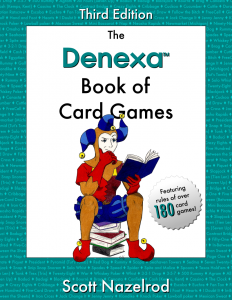 Five Hundred for four players uses a 45-card deck formed by stripping the threes and twos from a standard 52-card deck and adding a joker. 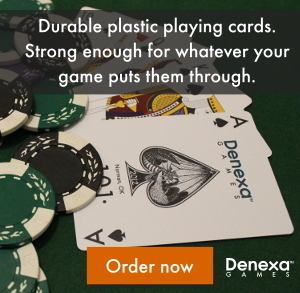 Just because the Bicycle folks dreamed up the game doesn’t mean you have to use their cards—Denexa 100% Plastic Playing Cards will do a better job of it. You will also need some form of scorekeeping device, such as a pencil and paper. Deal ten cards to each player, plus an extra batch of five cards to the middle of the table, using the following procedure: a batch of three cards to each player, a batch of two to the middle, two more to the players, two to the middle, three to the players, then two to the players. In the trump suit, Five Hundred ranks cards differently than most games, and since the ranking of cards depends on which suit is trump, some cards will have different rankings from hand to hand. Cards rank in the usual order, ace high, in the non-trump suits (save for the jack serving as the left bower). In hands with no trump, the joker stands alone as the only trump in play. Prior to the beginning of bidding, a player may declare “ace, no face”, meaning that they have exactly one ace but no face cards or joker. Upon making this declaration, the player’s partner may agree to have the hand redealt by the same dealer. The opposing partnership does not have any input into this decision. If the partnership declaring “ace, no face” decides to play on, they may not make a nullo bid (as described below). Bidding begins with the player to the dealer’s left, and continues to the left, with players either bidding or passing. A bid consists of both a number of tricks the partnership is aiming to win, and a trump suit, such as “seven spades”. Bids of six, called inkle (as in “inkle clubs”), are only available to the first two bidders; thereafter minimum bids start at seven. In addition to the above bids, there is a special bid of nullo, which counts for 250, and grand nullo or granola, which counts for 510. A bid of nullo is a bid of zero tricks with no trump, and the player’s partner sits out of the hand. A grand nullo can only be bid if the player’s partner has previously bid nullo, and is a zero bid for both players of the partnership. Players may also pass if they do not wish to bid. Nullo is outbid by any bid of eight or more; grand nullo cannot be outbid. If all players pass without bidding, the game is played with no trumps and no contract, with the target being simply to capture as many tricks as possible. Otherwise, bidding continues for three rounds. The final bidder becomes the declarer, and their bid becomes the contract for that partnership, which is the target number of total tricks for both partners to capture. The opposing partnership becomes the defenders, and their goal for the hand is to prevent the declarer’s partnership from making their contract. Normal bid or nullo (i.e. not grand nullo): the declarer takes the cards in the middle into their hand, and discards five cards, face down, back into the middle. Grand nullo: the player bidding grand nullo takes the middle into their hand and discards five cards. Their partner, the player bidding nullo, takes the five discards into their hand and discards five cards themselves. All players passed without bidding: The middle is not exposed. After the middle’s fate has been resolved, game play begins. The declarer leads to the first trick, unless there is no declarer, in which case the player to the dealer’s left leads. Play continues to the left. All players must follow suit, if able; otherwise, they may play any card. If the joker is led, the leader declares a suit which the other three players must follow, although this suit cannot be one which the player has already demonstrated they would be unable to follow themselves. The trick is collected by the player who played the highest card of the suit led, or the highest trump if one was played. The hand must be played out to the end, despite the fact that the outcome of the contract may have been decided. This is even true for nullo and grand nullo hands. When all ten tricks have been played, the declarer’s partnership counts the number of tricks collected and compares it to the contract. If they fulfilled the contract, they score the value of the contract, as shown in the above table. If the partnership broke contract by failing to collect the contracted number of tricks (or by collecting one or more tricks on a nullo bid), the value of the contract is charged against them. There is no penalty or bonus for exceeding the contract, although it does deprive the defenders of points. Regardless of the outcome of the contract, the defenders score 10 points for each trick collected. In nullo and grand nullo hands, the defenders score 10 points for each collected by the declarer’s partnership. In a no-contract hand where all players passed without bidding, both partnerships score 10 points per trick. Game play continues until one partnership exceeds a score of 500 by fulfilling a contract. If a partnership exceeds 500 by scoring tricks as defenders or on a no-contract hand, play continues. If a partnership ever reaches a score of –500, they automatically lose and the game ends.